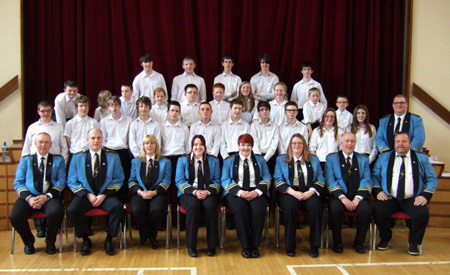 On Friday 6th June and Saturday 7th June the Junior Band and Training band attended a weekend of learning masterclasses which culminated in the end of year concert and prize giving with was attended by a hall filled with proud parents, family members, friends and supporters. The tutors were a selection of the principals from the senior band and considerable work was done with each section of the junior and training bands. The entire 2 day event was held in the War Memorial Hall, Carrickfergus. The concert consisted of ensemble playing from the Training Band under their conductor, Des Graham followed by a selection of music from the Junior Band under their conductor, Peter Arthurs. 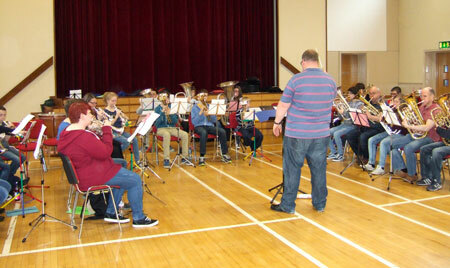 The tutors then joined in along with the two bands to showcase the work which was achieved over the weekend. 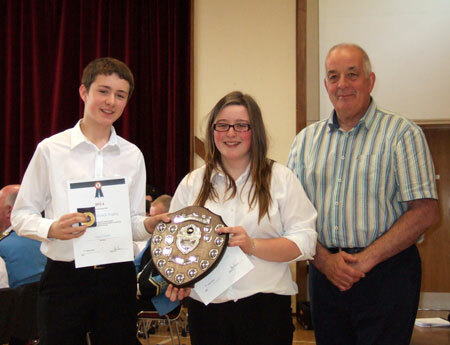 After the concert came the awards, with the prizes being given out by the band's special guest, Mr Ivor Stevenson, the driving force behind the annual Armagh Brass Band Summer School which takes place each year and features expert tuition from members of the Fodens Band. Our thanks go to him for his interest and attendance today. Our thanks go to all those who attended the concert today and we hope that you will continue to support the players of tomorrow. A special mention must also go to Peter Arthurs, Des Graham and all the other tutors and helpers without whom this excellent event could not have taken place. Click here to see more pictures from the concert and the prize winners. Congratulations to all winners, runners up, those who were promoted and all players involved today. The junior bands now go on their summer holidays and will start back again on Tuesday 26th August 2014 at 18:30 (Junior Band) and Saturday 13th September 2014 at 10:30 (Training Band).